Sometimes my recipe inspiration comes from unlikely sources. In this case, I first saw this recipe from my friend Samantha (not her real name, but her chosen alias. I’ll give you a second to digest the fact she has a need for an alias). Sam is one of my oldest friends, and once upon a time, she was the Lucy to my Ethel. I could (and probably should) write a whole book devoted to Sam, but today I’ll just share this one story. Sam’s mother wasn’t much of a cook, so she was not trained in the art of Thanksgiving since childhood. I helped talk her through her first Thanksgiving back in 1993 or 1994. I had thought I covered all of my bases. We went over the recipes and the shopping list and the How To’s, and I believed my little birdie was ready to fly. Then around 5:00 pm, while I was entertaining my own guests, the phone rings. Sam: I don’t understand! The turkey has been cooking FIVE HOURS and it’s still not done. It’s still pink and bloody and not brown like the pictures. Me: Wait, FIVE HOURS? I thought you had an eight pound bird. That doesn’t sound right. Maybe your oven is broken. Did you set it for 325 or 350? Sam: Uhhhh. I thought I was supposed to set the oven for 165 degrees. That’s the number you kept saying. Is that not right? Me: SAAAAMMMM!!!! 165 is the INTERNAL temperature. Remember? I said you needed a meat thermometer to measure the internal temperature of 165. The OVEN needs to be at 325. No wonder your turkey is raw. I didn’t even know an oven could be set so low. Sam: I thought internal meant INSIDE THE OVEN, not INSIDE THE TURKEY. Me: We will laugh about this one day. Enjoy your Thanksgiving pizza! Perhaps the above illustrates my surprise and delight that my little Sammy has come so far and is now picking out recipes on Pintrest and posting them on Facebook. Hey, it’s a start. 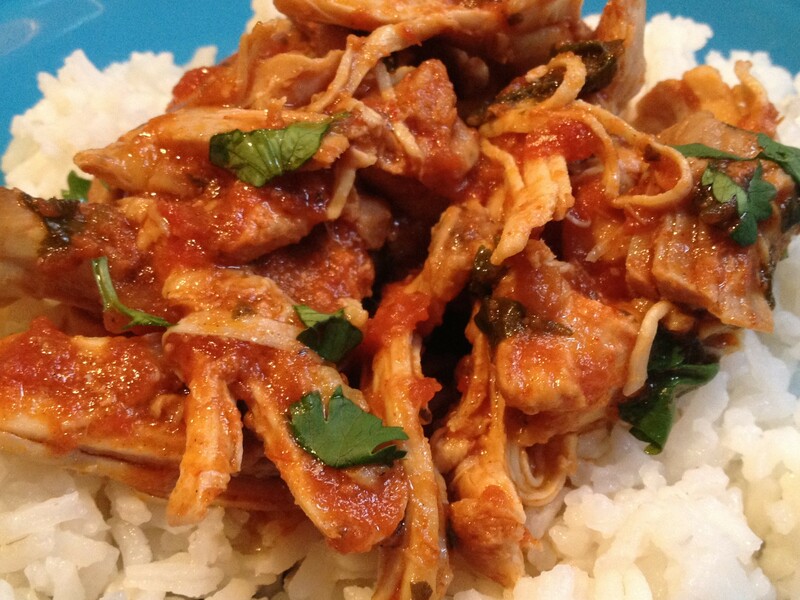 This recipe has all of my winning elements: crock pot, flavorful, easy. Added bonus: My whole family loved it. The only change I made is that I used boneless chicken thighs, as I absolutely hate boneless breasts done in the crock pot. I firmly believe that if you are crockpotting chicken, you either need to go for bone-in breasts or boneless thighs. Not everyone agrees with me, but I feel compelled to share this opinion with you. I served this over rice with a dollop of sour cream, and it was perfect. The author suggests using it for chicken tacos, and I think that’s a brilliant idea. Mix together first five ingredients in crock pot. Cover chicken with mixture. Cook on low for 4 to 6 hours. Shred chicken with a fork (removing any bones if necessary) and return to the crock pot for at least another 20 minutes. Serve with rice or as a taco filling. 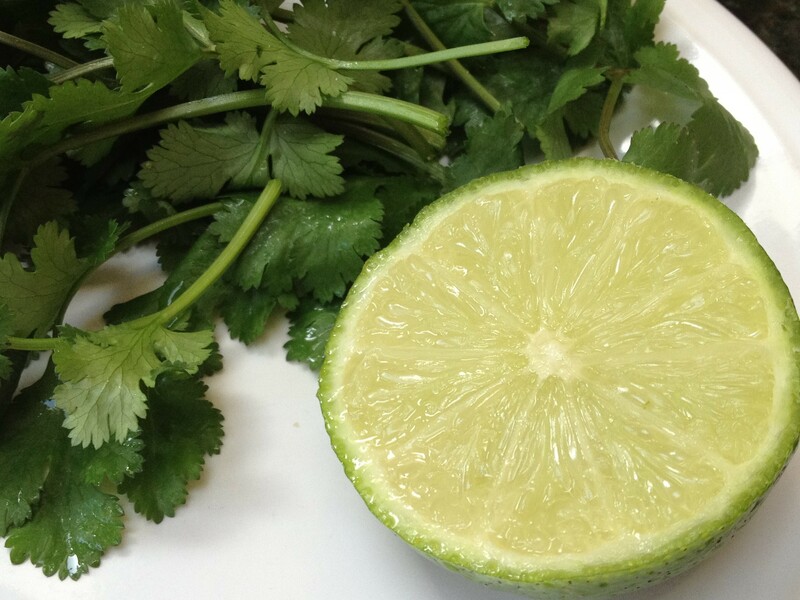 Top with more fresh cilantro. 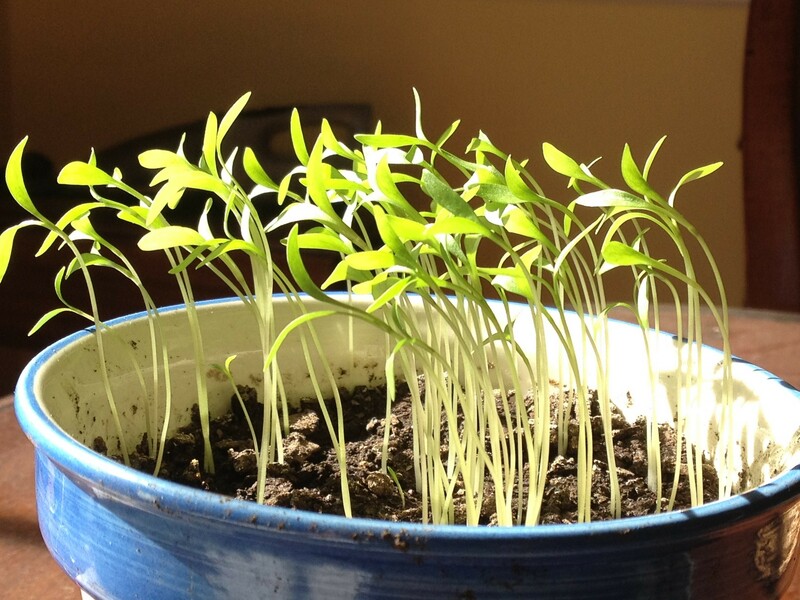 I have a thing for cilantro and try to grow some every year. This should be ready in a few more weeks. I also have a thing for limes, lemons’ classier green cousins. This entry was posted in Chicken, Crockpot, Main Dish and tagged chicken, cilantro, cilantro lime, cliantro lime chicken for crockpot by Mom Mom's Apron. Bookmark the permalink. Dawn, you’ve saved my weekend! Thanks, babe! Looks great. Love the Sam story.